The rotary kiln in the Walthers Cornerstone ‘Valley Cement Plant Kit’ has a lot of heavy surface detail which suggests an older style of kiln. To give it a more modern look I wanted to remove all this detail. So, I rigged up this ‘Heath Robinson’ affair to sand the surface down evenly. My Bosch drill might not be cordless, and has got to be nearly 40 years old, but it is still the best drill I’ve ever owned. Clamped in a vice and set to rotate at its lowest speed it got the job done in no time. 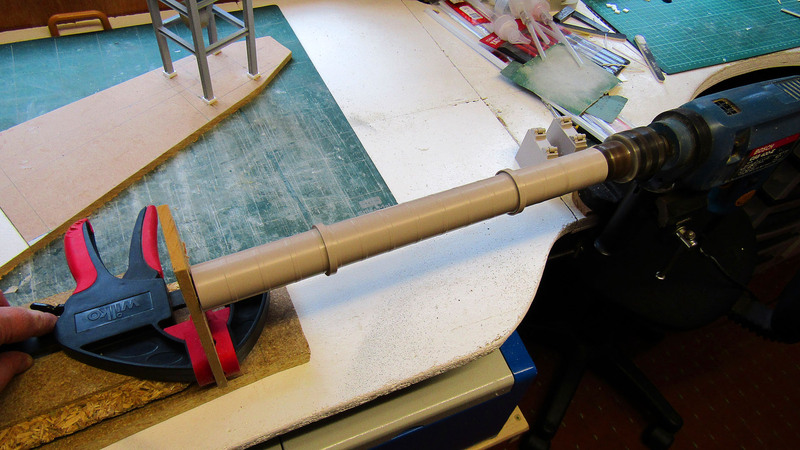 This entry was posted in Scratch building and tagged 1:76thscale, 4mm scale, acrylic, cement works, crossdale cement, dales peak, dcc, laser cut, laser cutting, model railway, modern image, OO Gauge, perspex, plasticard, preheater tower by Ian Robins. Bookmark the permalink.